Doing away with expensive purchases in favour of homemade gifts and treats could be one of the most rewarding things that you do this Christmas. Gifts that you’ve spent time making can be more meaningful, and the act of making them can give you a great activity to share with the family. If you want to create gifts that look professional, then the trick is to go for something that’s relatively simple – that way, you’ll have the time to perfect it. While some of those ambitious projects that you find online look great in the pictures, avoid choosing something that you know has a good chance of going wrong. We’re posting this in November to make sure you have plenty of time to get started. Start now and should have enough time to correct any mistakes that you make along the way. More importantly, you won’t feel stressed and in a rush. 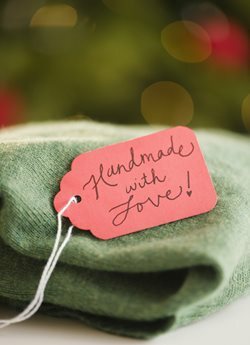 Approach homemade Christmas gifts methodically: search for ideas that you love, make a list and then buy everything that you’re going to need before you lay so much as a finger on the craft glue. We think that making Christmas gifts should be fun and relaxing; preparation is another great way to avoid getting stressed. So you want to have fun with the Grandkids and let them get involved, but you also don’t want anything to ruin that perfect gift you’ve been working on for your sister! Rather than trying to get the kids to help on your project, it’s better to find something child friendly that they can make, where it won’t matter if they want to make a mess or go wrong. One of the easiest ways to get frustrated is to choose a project that doesn’t just involve making the item, but also learning an entirely new skillset! If you’ve never baked before (or it was a disaster when you did), move away from the festive recipes and think about crafts that could utilise the skills you already have.